Are they faraway, these galaxies ? We have seen how important it is to know the distances to the celestial bodies, in order to be able to interpret what we see. To try to understand our universe, we must first be able to measure it. Galaxies appear as basic blocks of this universe, so it becomes essential to measure the distance between them and the Earth. As it is impossible to directly measure the distance to the furthest galaxies, we will use a set of measurements which are supported together, from the nearest distances to the furthest ones. There are three kinds of methods, the first one, the parallax gives us an absolute measurement, while the two others give only relative data. As the Earth moves along its orbit, you don't see a nearby star at the same place on the sky at two different times. This effect is called the parallax, and considering the distances to the stars - even the nearest ones - it is always very small. That's why it was not before 1838 that Friedrich Bessel was able to measure the parallax of the star 61 Cygni, which is only 11 light-years away. This method is in fact the only absolute method that we have at our disposal to know the distance of a star. So, it is essential to calibrate the other methods. to move against the deep sky. The method is only subject to measurement errors, but can only give distances less than 1000 Parsec. It is with this process that the Hipparcos satellite was able to map more than 120.000 stars. If the use of interferometry in optics is quite restricted, on the contrary we are able to build interferometers working in the radio waves range, with a base quite as large as we want. The VLBA - Very Large Base Array - is an array of radiotelescopes whose antennas are spread across the whole US territory, from Puerto Rico to Hawaï. As the base is very large, one can separate sources with an excellent resolution. So we are using this resolution to apply the parallax method to much greater distances than with visible light. With this method, the VLBA was able to measure the distance of the galaxy NGC 6264 with precision. This galaxy is located at 450 Mal (about 140 Mpc), with an accuracy of 9%. Of course, this method can only be used with galaxies which are radiowave emitters. But the correlation of this direct measurement method with other methods (that we are going to discover) will allow to increase the accuracy of these methods and to widely ameliorate our current measurements. Photometric measurements are based upon the visual magnitude of an object, whose absolute magnitude is supposed to be known. The oldest method uses Cepheid variable stars. These variable stars have a pulsation period directly proportional to their maximum luminosity. This relation was established in 1912 by Henrietta Leavitt who was studying the nearest Cepheid stars. Once such a star has been discovered in the galaxy under consideration, one measures its pulsation period, and so can determine its absolute magnitude. Its visual magnitude allows to calculate the distance to the star, and hence to its host galaxy. This method is useful out to a distance of about 15 Mpc. It is very accurate, but it is also time consuming and requires powerful telescopes. The most recent data come from the measurements made by the Hipparcos satellite. where P is the period of the Cepheid, and M its mass. The same method can be used with the type Ia supernovae. All studies show that these powerful explosions all have the same brightness. This method can be applied out to a distance of some hundreds Mpc. Similarly, we can also use the brightest planetary nebulae. They are quite easy to see because they emit light in very specific wavebands. Note also that nobody has ever found a good method for determining the distances to dimmer planetary nebulae in our own galaxy ! The same process can be used with the globular clusters. They can be easily detected in elliptical galaxies, because globular clusters stand out against the smooth background of the host galaxy. Finally, we can assume that the brightest galaxies in a cluster always have the same absolute magnitude. The uncertainty of this method is obviously greater than the others, but measurements can be conducted out to 3000 or 4000 Mpc. This is the use of the distribution of frequencies of the light received from an object. The broadening of the spectrum : The heavier a galaxy is, the faster the stars rotate around the nucleus. Because of the Doppler effect , light emitted by stars moving toward us is shifted to the blue, while those which move away are redshifted. As seen from the Earth, all the individual lines are indiscernible, and we can only see a broadening of the spectrum. The faster the galaxy rotates, the greater this broadening is. So, the broadening of the spectral lines is an indicator of the mass of the galaxy. The heavier the galaxy is, the brighter it is. And so, we can find the intrinsic luminosity of the galaxy from the broadening of its spectrum, with the help of the Tully-Fisher relationship (for the spiral galaxies), or the Faber-Jackson relationship (for the elliptical galaxies). This method is available as far as 3000 Mpc. The Sunyaev-Zel'dovich effect : it has been predicted at the end of the 1970's by two Russian physicits, who gave it their names. When the cosmological microwave background comes through an hot electrons cloud, as there can be found inside a galatic cluster, its spectrum will be modified. Electrons will scatter some of the photons (in fact less than 1%) to replace them with slightly higher energy photons, thanks to a mechanism known as the inverse-Compton scattering. The modification of the spectrum of the CMB is depending upon the temperature and the density of the electrons cloud, and its size. As this gas is hot, it will radiate X-rays. Analysis of this radiation will allow us to know the temperature and the density of the electronic cloud. So we can find its size from the theoretical model, and observing its apparent angle, we can deduce its distance. The original spectrum of the CMB is shown in solid line, while the modified spectrum - after crossing a galactic cluster - is in dashed line. The difference between the two spectrums fits with a difference of temperature of 0.5 milliK. Even if it seems easy, it is in fact a very tricky measurement : first, the X-ray detectors are difficult to gauge, and the electronic cloud is surely far from a perfect uniform and homogeneous sphere -it is at least denser at its center- and this fact makes difficult the interpretation of measurements. X-ray diffusion : X-rays emitted by a faraway object are diffused and delayed by interstellar dust. Measuring this delay gives us information about the quantity of matter crossed by the light, and hence about the distance to the emitting object. 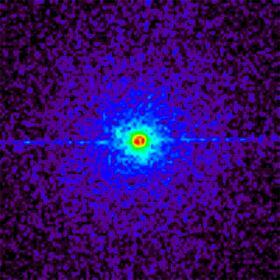 Image of Cygnus X3, as seen in the X-ray part of the spectrum by the Chandra telescope. The halo, beyond the yellow circle, is generated by the diffusion through the interstellar medium. The horizontal line is an artefact. This method is very new. It is currently being developed by NASA, by means of the Chandra observing satellite. Having established the distances to some galaxies, Hubble noticed an important fact : every galaxy seems to move away from us. A more precise study reveals that the recessional velocity of an object increases in proportion to its distance. As it seems quite presumptuous to think that the Earth is at the very center of the Universe, we must deduce that the Universe is expanding. The Hubble law is expressed as Vc = H * D, where Vc is the recessional velocity and D is the distance. H is called the Hubble constant. If H is known, we can deduce the distance of a galaxy from its redshift (usualy denoted z). Because of the uncertain value of this constant, this method is only meaningful and interesting for the furthest objects.